Why rent a room when you can enjoy a residence at Bauer's Spruce Island Chalets located in Evergreen, Colorado in the Rocky Mountains? We offer vacation, relocation, reunion and wedding lodging, from a Studio suite for 2 people to a 4 Bedroom cabin for 10 people. We can accommodate groups of up to 42 people. 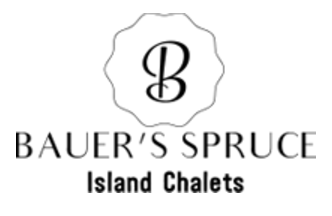 At Bauer's Spruce Island Chalets you have 12 acres available for hiking, picniking, relaxing, fishing, exploring, rock climbing and getting together with, or away from, your group. Our 7 units overlook the grassy picnic area surrounded by forested hills. We have a number of lawn games for your enjoyment. There are picnic tables and BBQ's for your dining pleasure. Your children can play on our Jungle Gym with Swings, Trapeze bar, Slide, and Fireman's pole. We do have a private pond, for fishing and ice skating. Our beautiful Gazebo sits right on the edge of the pond. A meandering stream runs through our property. You're welcome to fish in our pond and stream, But if you fish off our property you will need a license. There is an abundance of Deer and Elk that graze on the grass. Foxes visit us frequently, as well as squirrels and birds. An extensive array of wildflowers abound. Bauer's Spruce Island Chalets is adjacent on two sides to a 1000 acre open space park (Cub Creek Park) with many hiking trails, rock formations and beautiful meadows. The Maxwell Falls trail in Roosevelt National Forest is only a couple of miles up the road. We're only two and a half miles from Downtown Evergreen. Nestled in a quiet valley, right next to a 1000 acre open space park. Close to Town But Far Away From It All.